Trang An Scenic Landscape Complex, nested in Ninh Binh Province of the northern Vietnam, is a wonderful honeymoon landmark which makes the sweet trip to Ninh Binh truly enjoyable. The destination refers to the convergence of culture, nature, and sweetness. More and more couples take wedding photography in the dreamlike sceneries of this destination, and for sure, it’s one of the most thoughtful decisions of yours to honeymoon in Trang An. Trang An – Where Landscapes of Fairy Tales Meet Traditional Culture. Trang An Scenic Landscape Complex contains the four protected regions: the Hoa Lu Ancient Capital, the Trang An Eco-tourist Site, the Tam Coc-Bich Dong Area, and the Hoa Lu Special-use Primary Forest. The whole complex has 6.172 ha, with the limestone mastiff and encompassed mainly by the spectacular rice fields. This mixed cultural and natural property was inscribed as the UNESCO World Heritage site in 2014 based on the cultural value, the scenic and aesthetic value, and the geological and geomorphological value. Obviously, the Ninh Binh Honeymoon Packages to this enchanting complex involve lots of excitements for the new brides and grooms. Activities in Trang An Scenic Landscape Complex for Couples. The honeymooners worldwide should always never miss Trang An if they set foot on Ninh Binh. And if you visit this world’s mixed natural and cultural heritage, make sure you and your sweetheart explore the core zones of Trang An Eco-tourist Site, Tam Coc-Bich Dong Area, and Hoa Lu Ancient Citadel. Each of these extraordinary zones offers numerous flattering corners for sightseeing, photographing, biking, relaxing, and creating sweet memories together. Honeymoon there, you both join the peaceful, natural, and cultural landmark which only a few places can compare. It’s a destination where true love can blossom and remain eternal. The mixed heritage of culture and nature lets the vacationers contemplate the unrivaled sceneries in Tam Coc-Bich Dong Landscapes. And if you want an enjoyable back-in-time trip, just proceed to Hoa Lu Ancient Capital. What’s more, head towards the Bai Dinh Pagoda, a local Buddhist center, to pray for the goodness, love, and health. 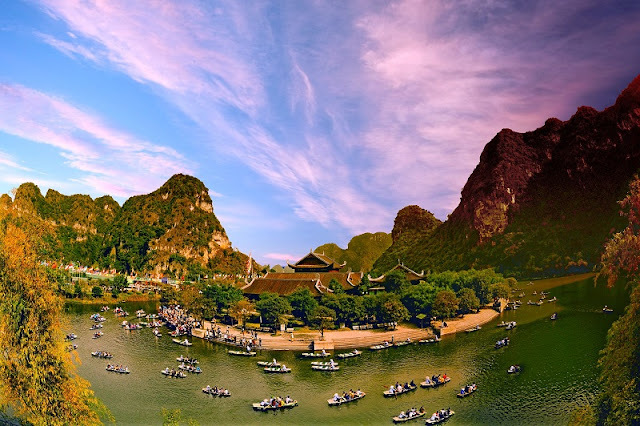 From this moment, think of your Vietnam Honeymoon Tour Packages and evaluate if Trang An in Ninh Binh Province is competent enough to suit your desires! Not only the dreamlike sceneries, but this Northern Province also has lots of delicious dishes to please the gourmets. If you get there, take your opportunities to savor the tastes of the fried rice served with sauce, Kim Son fish salad, Hoa Lu rare goat meat, Yen Lac sour sausage, the boiled mountain snails, sticky rice with ant eggs, etc. From cuisine to culture and nature, there are various interesting things for you and your spouse to experience hand-in-hand. Provided that the big days are coming, and you have not decided where to honeymoon yet, then make it clear that you should invest the sweet days and nights in Vietnam’s first mixed natural and cultural heritage inscribed by UNESCO. Just do a simple online research about Trang An, and you will come up with dozens of bewitching photos. Some couples even don’t believe that there exists such a paradise on this earth or think that they are some scenes from the fairy tales. Booking your honeymoon in Trang An is the best idea, fast. Contact us now to get the perfect plan for your holiday.